FMS Dental Hospital: Scaling & Root Planning Treatment in Hyderabad, India. Scaling & Root Planning Treatment in Hyderabad, India. The main cause of these diseases is bacterial plaque, a sticky, colorless film that constantly forms on your teeth. If plaque is not removed on a daily basis it can turn into a hard substance called calculus (tartar). When plaque and calculus are not removed the bacteria in plaque produce toxins (or poisons) that can destroy the supporting tissues and bone around the teeth. As the diseases progress, the gum around the tooth becomes loose and separates away from the tooth resulting in deep areas called pockets. 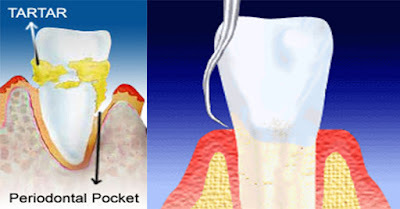 As these pockets deepen, more gum tissue and bone are destroyed and the teeth eventually become loose. If periodontal diseases are not treated, the teeth may need to be removed.